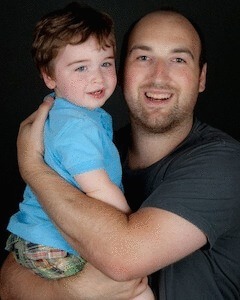 One of the best times of the day for me is bath time, but it’s not my bath time it’s my child Marc’s bath time. It’s a true bonding time for us. Marc wasn’t always in love with the Bath, he was actually kind of hating it. My wife and I worked at it for about a week before I started to get half undressed and stand in the bath and start to splash him in the tub. Soon enough he was having a ball and now he just sits in the tub and just plays for 20 or so minutes. I love this time because it’s simply me and him – no distractions. 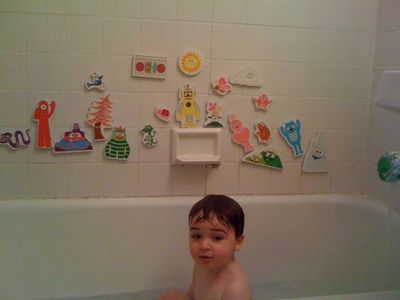 We high five each other, play with these bathroom Yo Gabba Gabba wall stick toys, and splash each other. We both laugh, usually because Marc’s laugh is so cute and it makes me laugh. We have a few other bath toys like a rubber ducky and some squirting fish toys but he doesn’t seem to mind them much attention. I’m looking forward to the days of drawing on the bathroom walls with those special bath crayons (cause I’m such the artist :P ). Even when it’s not bath time he is super excited to get in the bath and most of the time even when it’s not his bath time he’ll still try to get into the tub. Which I don’t know if my wife or I really enjoy an sudden game of peek-a-boo in our birthday suites, but we laugh it off for now.